The EU has committed to ambitious Climate and Energy goals by 2020: decrease energy consumption by 20%, increase the share of renewables to 20% of the total energy mix, and lower greenhouse gas emissions by 20%. Thousands of EU cities have joined the movement to achieve these goals and have signed on to the Covenant of Mayors. Over 30 cities in Ukraine are also participating in this pan-European initiative. The EU-funded project, “Covenant of Mayors Capacity Building Model” supports local authorities in Ukraine and Georgia in improving their energy security, reducing greenhouse gas emissions and thus enhancing their citizens’ quality of life. With an EU grant of almost €500 000, the “Energy Efficient Cities of Ukraine” (EECU) association is leading the project. 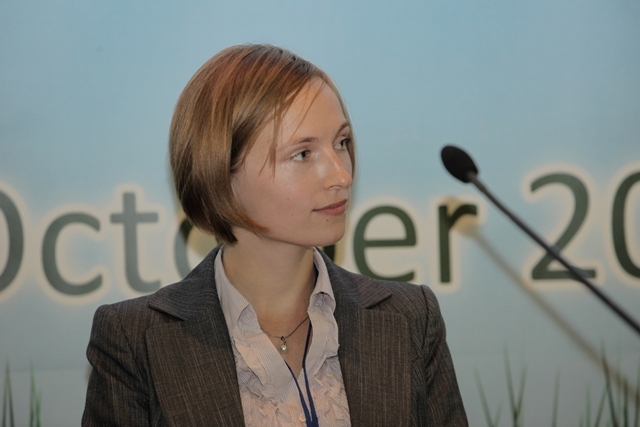 We talked with Agnieszka Schirru-Nowicka, Project Manager and Deputy Director of the Agency of Sustainable Energy Development of the EECU, about the advantages of joining the Covenant of Mayors initiative and the importance of energy management systems in Ukraine. How many cities in Europe participate in this initiative? 4600 cities throughout Europe, which incorporate 176 million citizens. It is a huge movement and it is developing very dynamically. How many cities have joined this initiative in Ukraine? Over 30 cities. 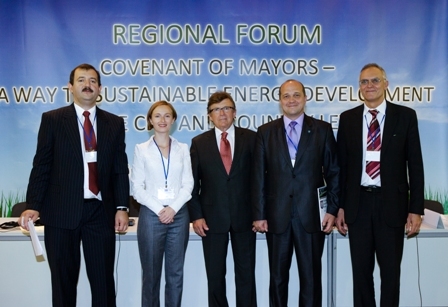 The great majority are members of the Energy Efficient Cities of Ukraine association, an official Covenant of Mayors supporter. We officially support Ukrainian signatory cities in meeting their Covenant obligations. Why would a Ukrainian city become a member of the Covenant of Mayors? Ukrainian cities that participate in this movement are given support toward reducing their energy consumption and expenditures through EU funding and endorsement. They can also become pioneers by sharing expertise developed in their own territories and likewise benefit from the encouragement of others. Can a Ukrainian signatory city of the Covenant of Mayors attract EU funds and obtain bank financing to enhance its energy efficiency? Yes, being a signatory increases the credibility of Ukrainian cities in the eyes of donors and financial institutions. It is highly important to them that the potential beneficiary city is able to control, plan and manage its energy consumption and expenditures. So if a city has a functional energy management system, it has a better chance of receiving an EU grant or support from other international donors. EECU is currently working with international and national financial institutions to provide more opportunities to obtain bank financing. 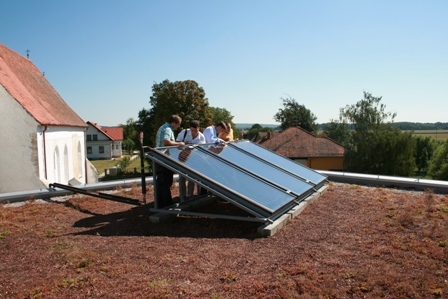 Your project helps cities develop Sustainable Energy Action Plans. What specific elements do these plans include? You mentioned municipal buildings. Does this mean that the Covenant focuses on the public sector, or does it stimulate changes in the private sector as well? It depends on the country. Many EU cities have strong energy cooperation with the private sector. In Ukraine this kind of cooperation is more complex. Therefore, Ukrainian signatory cities focus on controlling energy consumption in municipal buildings. Only after this can the city start to work with residential buildings and with the private sector. One of the goals of the Covenant of Mayors is to increase the share of renewables to 20% by 2020. What are the key opportunities in Ukraine in this field? It depends on the city. Cities in Crimea have better access to solar and wind energy. Many Carpathian cities utilize mini-hydro facilities and some cities in central Ukraine often have good access to biomass. One of the key cities of your project is Kamyanets-Podilskiy. Are you trying to spread its experience to other cities in Ukraine? Yes, Kamyanets-Podilskiy is a mentor and a partner in our project, along with the Georgian city Rustavi. We have documented the city’s best practices, in the form of case studies, along with two other of the most advanced Ukrainian Covenant signatories, Lviv and Dolyna. All of these case studies will soon be available on the project website: http://eecu-comogrant.org.ua/en/. Imagine I am mayor of a city and want to join the Covenant of Mayors. Should I contact you and the Association Energy Efficient Cities of Ukraine or should I directly contact the Covenant of Mayors office? You can do either, but as an experienced official Covenant Supporter in Ukraine, EECU is able to effectively support you in working through the process of joining the Covenant of Mayors. We also support our member cities throughout the year by organising conferences, trainings and other relevant networking events. There is also a regional Covenant of Mayors Office-East located in Lviv. There are helpdesk experts available that support cities not only from Ukraine, but also from other Eastern Partnership and Central Asian countries, such as Belarus, Moldova, Georgia, Armenia, Kazakhstan and Kirgizstan.